On Sunday, Sept 28th, 2015, NH Management & BNICS is presenting a benefit concert to support, celebrate and honor youth & adult children with disabilities. 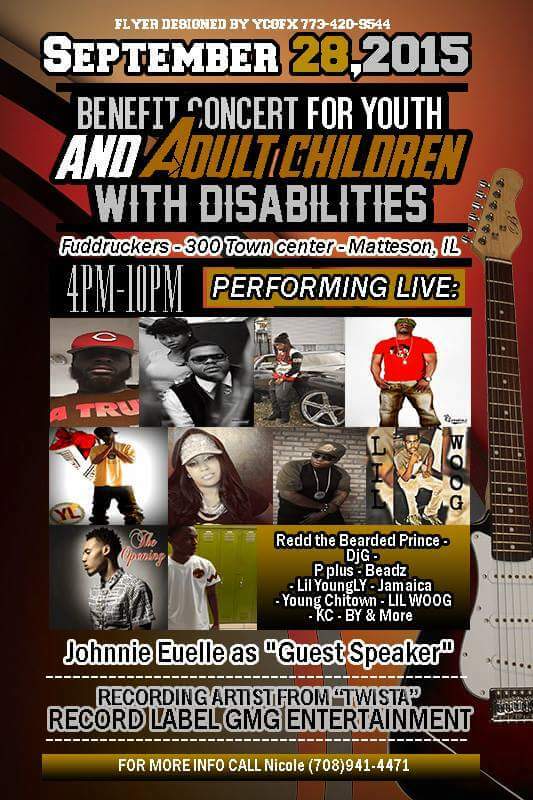 The concert will take place at the Fuddruckers at 300 Town center in Matteson, IL and begins at 4:00 P.M. (doors open for seating at 3:30 P.M.). Recording artists: Beadz Jones, Jamaica, P Plus, Yung Ra Ra, Redd DA Bearded Prince, “Chucth”Da Rapper, BY, KC, Young Chitown, Prince Dman, Prince No, Birdy Montana & Prince Jae are the featured performers for the evening, with special guest speaker Johnnie Euelle & a Grand appearance and performance from GMG Recording Artist Twista. As well as D. J. Dion from Power FM 92.3. The concert is free an open to the public.